The program module “Flight Management” named as FM is one of the basic modules of AS, where you can also access other modules. FM allows user to view the current events at the airport on a daily basis, as well as short-term events planned for the period defined by the user. In addition to viewing allows users to add ad-hoc flights, flight status update (landed, switches off the engine, burning, flew), and automatic connection with modules for informing passengers: Flight Information Display System – FIDS and Flight Information System Sound – FISS. At the same time FM creates the required message type MVT (incoming and outgoing) and provides a permanent connection with NSITA (niko-sita) module to send and receive IATA messages via SITA communication. 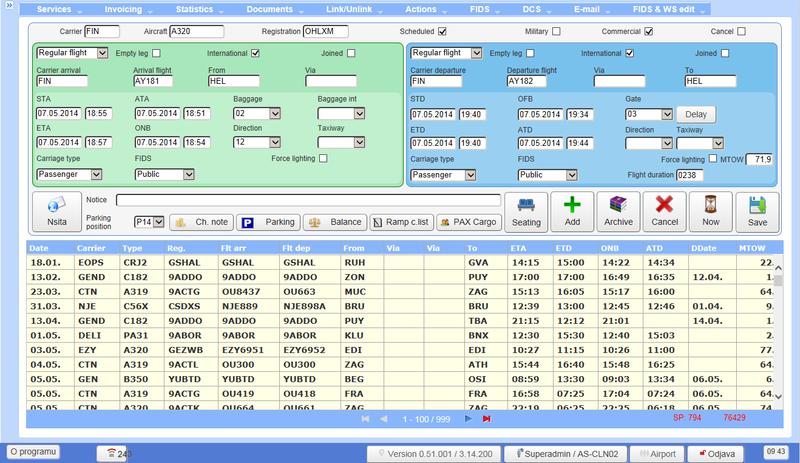 FM uses the principle that the user sees a list of only those flights that fall within the scope of his work and to a point until the job is done, and then it is removed from the list. An integral part of the FM module are lists and code lists required for the normal functioning of the AS such as the list of airports, carriers, types of aircraft, delay codes, country etc. 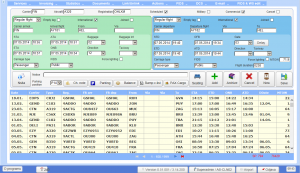 Over FM module is able to enter and use other modules of AS package, such as TimeTable – TT, Seating, Weight and Balance – W & B, Invoicing, FIDS, FISS, Statistic, Ramp Control – RC etc.